GRAND RAPIDS, MI â Walking to Cherry Park is part of the daily routine for Rachel Lee and her children. Splashing around in the park’s wading pool no longer will be one of the activities they enjoy there. Grand Rapids this summer again plans to open full-size swimming pools at Briggs, Martin Luther King, Jr. and Richmond parks. But the city also will close its remaining wading pools and, for the moment, there’s nothing in the works to replace them. “That was really the only option for a lot of kids to cool off on a hot summer day,” said Lee, co-chairperson of the East Hills Council of Neighbors. “Not all of our neighborhood kids can get to MLK (for the full-size pool). Grand Rapids over the years has closed and removed several of its wading pools as parks spending has fallen. 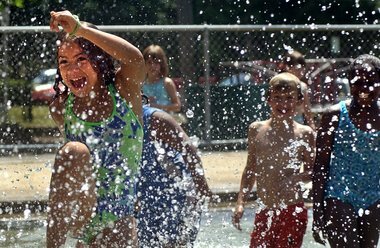 Five remaining pools at Campau, Cherry, Garfield, Westown and Wilcox parks will not be opened this year. Removal of the pools is planned. City officials cite concerns with cost, health and staffing as reasons for decommissioning the 7,400-gallon wading pools that have been part of city neighborhoods for decades. The parks group will work with city leaders in coming weeks to fine-tune a millage proposal that could generate about $4 million per year. A property tax of 1 mill would bring in about that much money annually. Of the $40 million-plus designated for capital improvements in the city’s 2013-2014 budget, about $99,000 is earmarked for parks. Grand Rapids plans to spend about $650,000 in general-fund money opening and operating the three full-size swimming pools from July 1-Aug. 17.